Baking is my main form of stress relief, or as I like to call it, procrasti-baking. I basically put everything off until after I've made some yummy goodies and feel a lot more calm and less anxious. So, because I bake once a week usually as part of my self care routine, I bring my bakes into work and we all share them on a Sunday shift. I don't know what it is about eating roast dinner that brings out the worst in people, but Sundays always seem to mean that we have our grumpiest customers in. These were possibly my most popular yet, and they were definitely something I could eat a whole tonne of. 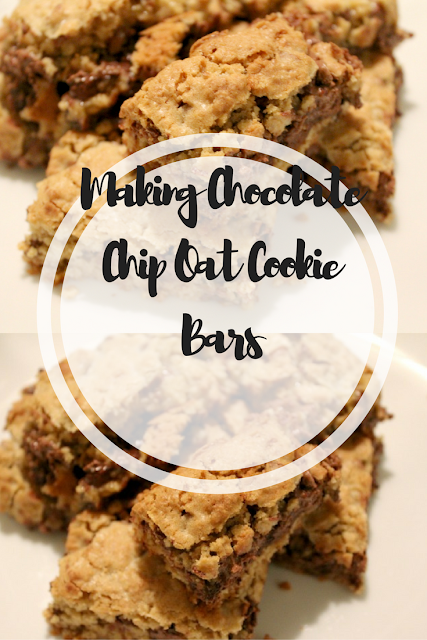 Because of the oats and the use of dark chocolate, they weren't overly sweet, so you never got to a sickly stage of consumption (which has both pros and cons, hehe). As always with my bakes, they didn't go quite to plan. BUT, I did actually use ingredients that made a perfect recipe this time. What went wrong was my baking tray size: it was too big so the mixture didn't end up going all the way to the edge. Thus, instead of coming out of the oven as a perfect rectangular bake, it looked more like a giant cookie. And god was it a tasty one. 1.) Preheat the oven to 180 degrees and grease your pan with some butter and lay a sheet of baking paper in it. 2.) Cream the softened butter and both types of sugar together. 3.) Add the eggs individually, stirring after each one. Add the vanilla essence. 4.) Stir in all of the dry ingredients, including just 150g of the chocolate chips . 5.) Press half of the mixture into your baking tray. Cover with the remaining half of your chocolate chips, and then cover this with the second half of your mixture. Think of it as a chocolate chip sandwich *drools*. 6.) Bake for 25-30 minutes until golden brown and leave to cool for 45 minutes. What's your favourite thing to bake at the moment?